Former New Orleans Mayor Ray Nagin Found Guilty Of Corruption : The Two-Way Ray Nagin was indicted last January, when prosecutors said he engaged in bribery, wire fraud, money laundering, conspiracy and filing false tax returns. Former New Orleans Mayor Ray Nagin enters court for his corruption trial in New Orleans last month. He was charged with accepting bribes, free trips and other gratuities from contractors in exchange for helping them secure millions of dollars in city work. 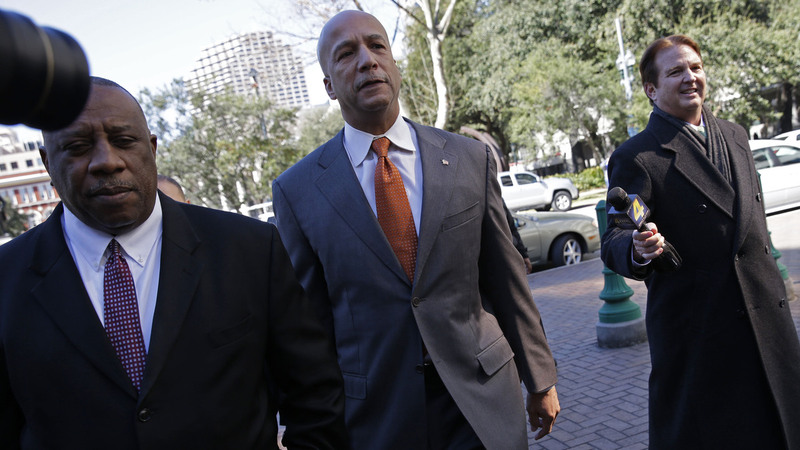 A federal jury has found Ray Nagin guilty of bribery and fraud. The former New Orleans mayor, 57, was accused of taking hundreds of thousands of dollars in bribes and kickbacks, in an indictment that included 21 counts. He was found guilty on 20 of those counts. Prosecutors also said Nagin accepted perks such as free travel and played a role in funneling money and granite to Stone Age, a company run by his sons. The counts cover a large portion of Nagin's two terms as mayor from 2002-2010, a tenure that included the Hurricane Katrina disaster of 2005. A full conviction could have meant a prison sentence of more than 20 years and fines of more than $1 million. When U.S. District Judge Helen Berrigan turned the case over to jurors Monday, she instructed them to examine each count against Nagin individually, allowing a partial conviction. The verdict comes days after Nagin, a Democrat, sat for hours of questioning by federal prosecutor Matt Coman, who presented emails, credit card statements and other records in an attempt to undermine Nagin's insistence that he is innocent. "You sold your office, didn't you?" Coman asked Nagin at one point, the New Orleans Times-Picayune reported. "No, I did not," the former mayor answered. Nagin was indicted last January, when prosecutors said he engaged in bribery, wire fraud, money laundering, conspiracy and filing false tax returns. The case was investigated by the FBI, the IRS and New Orleans' inspector general. The charges leveled against Nagin came 10 years after he won the New Orleans mayoral seat as a reformer who promised to clean up how the city's government works, as NPR's Debbie Elliott reported in January. After leaving office, Nagin moved to Texas. "The trial included a roll call of personalities that have been in the news for years because of the City Hall corruption case: former city technology director Greg Meffert, who pleaded guilty to taking bribes in exchange for awarding city work and said he helped arrange payoffs and perks for Nagin; contractor Rodney Williams, who also pleaded guilty and said he and his business partners gave thinly veiled bribes to Nagin; Frank Fradella, another issuer of a guilty plea, who said he paid for travel and orchestrated bribes of cash and granite for Nagin; and Fradella associate Michael McGrath, serving time for massive mortgage fraud, who also said he used barely veiled techniques to channel bribe money to Nagin." Delivering his closing argument Monday, defense attorney Robert Jenkins told the 12-member jury not to believe those witnesses, pointing to their plea deals with prosecutors. He also took a shot at the local paper, which printed stories about the allegations during Nagin's time in office. "They are going to try to convince you that they can prove a crime, and they can't even produce a paper seven days a week," he said, according to the Times-Picayune. Nagin is expected to be sentenced in June.